Florida is trailing FAU 7-2 in the top of the fifth inning. As Nelson Maldonado singles home Nick Horvath the Cincinnati Reds select Jonathan India fifth overall in the 2018 MLB Draft. He isn’t able to be with his parents, family, girlfriend or friends. He isn’t watching it live on MLB Network, at 6:39 when the Reds’ pick is announced India doesn’t even know he’s going to be a Red. He’s walking up to the plate to face Zach Schneider. That’s how India, who has spent his entire life waiting to become a professional baseball player found out his dream was realized. Walking back to the dugout, his team losing 7-3 in a Regional game. Not quite how Hollywood would script it up for a movie. That’s the cruel part of the MLB Draft, which occurs during Regionals or Super Regionals every year. Last year Alex Faedo was on the mound pitching against Wake Forest when the Detroit Tigers picked him 18th overall. His mom, girlfriend and brother were in a room at McKethan stadium, huddled in front of a television without him when the news came across. Monday the Gators and Owls had a game scheduled for 1 p.m. The decision to play at that time came from the NCAA headquarters in Indianapolis, who apparently didn’t check local Gainesville forecasts that predicted rain from 2 p.m. through 5 p.m. Rather than play the game earlier in the day Florida and FAU were forced to wait through a more than five hour weather delay. It happens all over the county and it happened on the other end of the spectrum Monday in Gainesville. FAU shortstop Tyler Frank was drafted 56th overall by the Tampa Bay Rays. Florida ended the Owls’ season Monday. Frank, with tears in his eyes after saying goodbye and thank you to his teammates, finds out. Then he has to go do a press conference to talk about his college career ending. Vanderbilt manager Tim Corbin calls the timing disrespectful, and he’s right. Could you imagine the NFL Draft being held during the College football playoff or the NBA Draft being held during the Elite 8 or Final 4? It would never happen. What is stopping the MLB from moving the draft back three weeks until after the College World Series? Or even back a day to start on a Tuesday, avoiding the chance of having players stuck on a field while their dreams unfold without their knowledge? It will continue to happen until the MLB decides to make a change to the date, which is arbitrary. 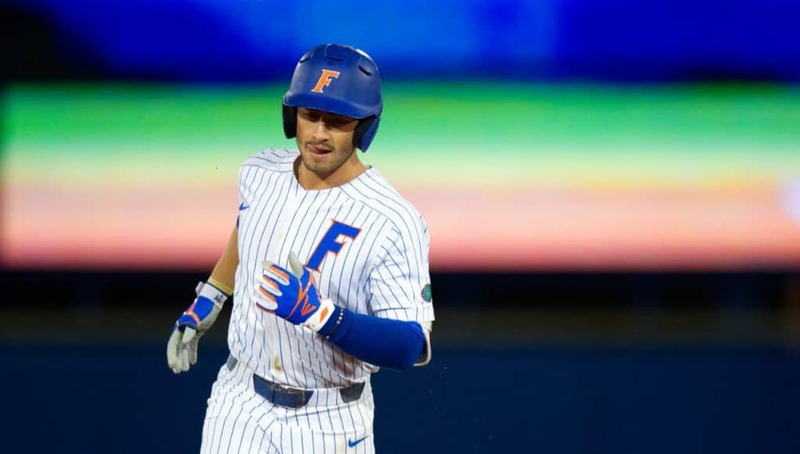 India, Brady Singer and Jackson Kowar should have spent the day with their loved ones; instead they were stuck in a clubhouse waiting out rain for six hours while waiting for a game to start. India found out his fate from a stranger in-between innings. The end turned out well, he and the Gators were celebrating, but the other end of the spectrum was there. The happiest day of Tyler Frank’s life will always be synonymous with the end of he and his teammate’s season.